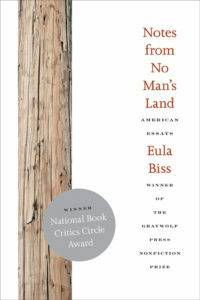 “Even now it is an impossible idea, that we are all connected, all of us,” writes Eula Biss in Notes from No Man’s Land: American Essays, a provocative exploration of race in America. Biss is talking about telephone poles and wires, the massive project of connecting every home in the country following Alexander Graham Bell’s invention of the telephone. But she is also talking about what enabled enraged whites to hang blacks from telephone poles in the late 1800s and early 1900s for “crimes real and imagined” and what continues to allow racial privilege to persist. In the dazzling opening essay, “Time and Distance Overcome,” Biss begins with Bell’s invention, a fact your average elementary school student could recite. Less well known, though, is the “war” on telephone poles that followed; viewed as a blight on the landscape, the poles were often cut down as quickly as they were erected. Biss draws her readers in with these interesting, if benign, historical footnotes before punching them in the gut with a graphic catalogue of black men lynched from telephone poles. “Now, I tell my sister, these poles, these wires, do not look the same to me,” she writes. This is a technique Biss employs throughout her collection, connecting the seemingly unconnected, making the familiar strange as she works to unsettle her readers’ perceptions of race. Marion Wyce‘s review of Notes from No Man’s Land first appeared in TLR’s Fall 2009 issue, Therapy!